Jardine's 5-Star Barbecue Sauce 18oz. 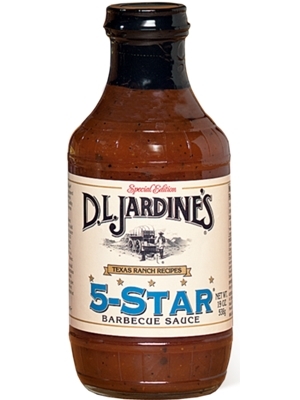 Jardine's 5-Star BBQ Sauce will win rave reviews around your kitchen table for its authentic Texas taste. Earning first place at the Texas Fiery Foods Shoot Out, it's also a local favorite, bringing home the blue ribbon as Buda's Country Fair and Cook-Off. Try some on your next batch of chicken or ribs and discover why serious BBQ lovers have made 5-Star a super popular sauce. 18oz. Brown sugar, water, tomato paste, mustard (distilled vinegar, water, mustard seed, salt, turmeric, paprika, spice, garlic powder), onions, vinegar, soy sauce (water, wheat, soybeans, salt), Worcestershire sauce (distilled vinegar, molasses, corn syrup, water, salt, caramel color, garlic powder, sugar, spices, tamarind, natural flavor), celery, bell pepper, salt, lemon juice spices, jalapeno peppers, garlic powder, orange peel, natural hickory smoke, corn starch, xanthan gum (a natural thickener), cilantro and caramel color. *Contains Wheat and Soy ingredients.